Boxers are great family dogs since they love people and are very affectionate. This strong, powerful and intelligent breed also has a lot of energy to burn. Owners looking to buy toys for their Boxer should look for something that is fail-proof, durable and complements their playful and active nature. So what dog toys on the market are best to keep your Boxer from getting bored and misbehaving? Boxers are a large dog breed that can weigh up to 70 pounds and reach up to 25 inches in height. They’re known for their muscular build, square jaw line, and large underbite. Boxers have a deep, loud bark and are known for being playful, outgoing, and lively. Their short hair that barely sheds, which is great for people who hate having dog hair around the house all the time. The underside of a Boxer’s coat is usually tan or marble, with the rest of their coat varying from light to dark brown and even white. How Do Boxer Dogs Like to Play? Boxers are a dog breed that is very intelligent and make good service animals in some industries. The breed was developed in 19th century Germany for hunting and controlling cattle, and those instincts should be taken advantage of during playtime. TIP: Any games or toys that fire up a Boxer’s herding and hunting instincts will keep them happy and engaged. Boxers are high energy dogs, so it is recommended that they get at least one hour of exercise per day. Even though Boxers can be shy when it comes to other humans, they love to play with other animals. Owners can have fun with their Boxers by taking them to dog parks or having them play with other cats and dogs at home. When it comes to taking camping trips, backpacking or hikes, Boxers should be on a leash to avoid them taking off after small animals like squirrels. Boxers are larger breed dogs with high energy levels, so owners should find high energy activities for them to play like Frisbee or fetch. Outdoor activities in spaces where a Boxer can stretch its legs are best. Since they are intelligent dogs, Boxers can also do well with agility training although you need to be patient and use a lot of positive reinforcement. Boxers don’t respond well to harsh treatment so training them can be a little more difficult for some owners. With their history of herding and hunting, hide and seek can be a great game to spark a Boxer’s senses. Owners should start by having their Boxer stay while they go hide a toy, treat, or themselves. Once ready, owners can give their Boxer the go ahead to come and find whatever is hidden! This game gives Boxers a chance to run around and plays into their natural instincts, which is great. Toys that make fun sounds are great for keeping Boxers busy, but they need to be durable to withstand this large breed’s idea of fun. 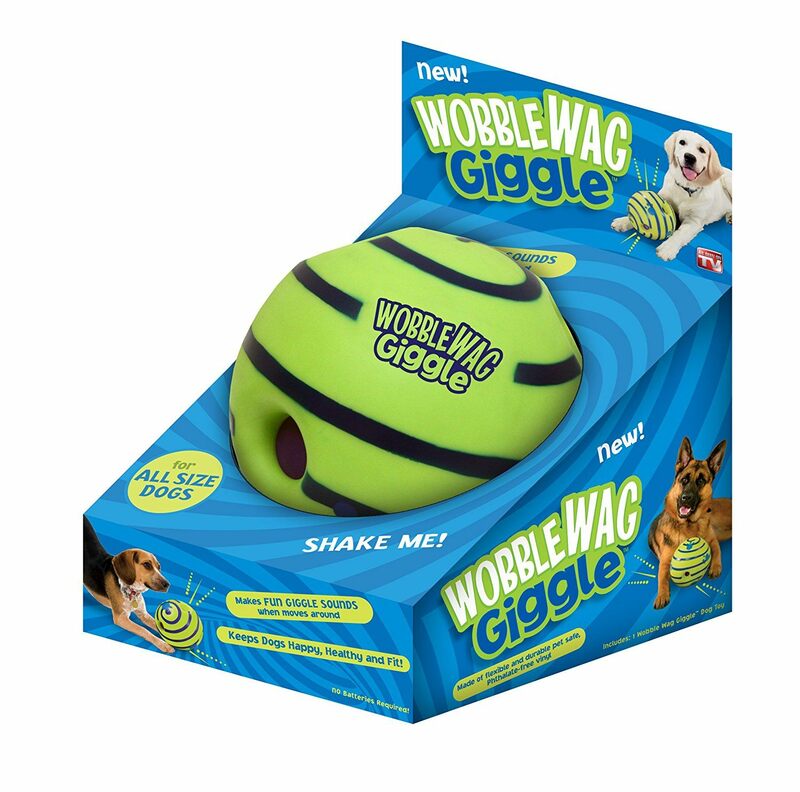 One toy that is recommended for boxers is the Wobble Wag Giggle Ball, a strong chew toy that your dog can pick up, toss, and carry around as it makes squeaking and giggling sounds. Throwing and retrieving toys can be a great way for owners to take their Boxers out to run around in the fresh air. Since Boxers are a playful breed they will always be happy to retrieve any toy you throw for them. One guaranteed durable option is the West Paw Design Tough Dog Bone Chew Toy, a nontoxic and American made dog toy. A guaranteed winner for many dog owners! Always use common sense when buying toys for your pets, and buy toys that are appropriate to their sie and strength. If you have a large breed dog like a Boxer, don’t buy small balls that they could choke on or soft squeaky toys that they can easily tear apart and eat the contents of. Boxers are great dogs that make loyal family pets. They are an affectionate, playful, and attention seeking breed that always wants to be near its family and are happy with just about any form of play time. Boxers have a lot of energy and require dedicated owners who will make sure that they get enough stimulation and time outside to exercise. Boxers are a great dog for active owners who already have other pets, since Boxers get along well with other animals.